Yes, my dad, Bill, (remember, I have 2 Bills! ), he was very ill, dehydrated today, and I just dropped everything, and went to see him, he couldn’t walk very well, dizzy.. So, off we went to the local ed. His labs were ok, he received a liter of iv fluid, and I saw the local er. Family, my dad, nothin’ like it. What can we say about our dogs? To start with, we love every one of them. We have raised them ourselves, most of them from puppies. Some have came as adolescents. A couple have flown across the sea, starting with Contessa del Gheno, followed by Ettore and Florra del Gheno, from our close friends in Italy. We can’t help but show off our Neo family! 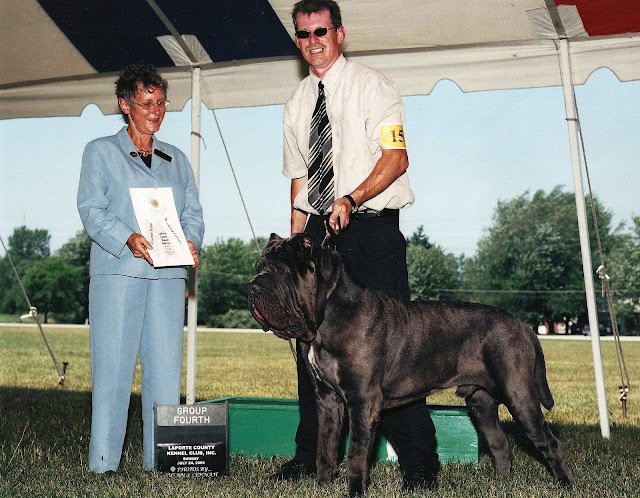 Centurian Mastini is well into it’s 4th generation of excellent neapolitan mastiffs. Each generation shows improvement, health and conformation wise, over previous generations. We have 4 generations here, at CM, on the ground. We are planning a 5th. And will be happy to show you. How many other breeders, can say that? Longevity is a much proclaimed issue, and many breeders say, that it is a priority, and a goal of theirs. But, when it comes to ages of dogs at their time of death, how old do their dogs actually live??? Do lifespans improve from generation to generation?? Or, is this simply lip service, served up to the unsuspecting anxious, excited puppy shopper? We, here at CM realize this is a painful subject, especially when a beloved dog dies so young, having experienced this heartbreak. This will only improve if breeders are actually working together to decipher the reason behind the young ages of death in so many very young dogs. Ask your potential breeder for statistics. Do some research. Ask how long their dogs average lifespans are. And then, think about your decision. And one more question for your prospective breeder. And do your research. Ask them what they do with the dogs they are done breeding for them. Please, ask them. You may be very surprisedl For example, the ex-president of the national club puts his dogs into rescue. Then, ask us what we do with our beloved dogs. Please, ask us. Centurian Mastini Prime Hickory Joe! Sera’s puppy, with Optimus Prime… He is doing very well, 3 weeks old in a couple of days… big boy. Funny.. Heard him BARKING 2 nights ago, in the middle of the night. He is getting around, like crazy, in his little kennel, and in Sera’s. They are in 2 crates next to each other, and he is with Sera, several times a day, for feedings, and snuggles. He snuggled with Bill for a long time, last night! Sorry, didn’t take on last post, but… this deserves it’s own post, anyway…. Apollos, group 4 placement by Rita Biddle, respected neo judge! and… my lover boy, Merlin….. Offspring to Blanch O Zeus, 2 time world champAnd.... on a 90plus degree day, Rita Biddle, chose Apollos as a group 4. Again, Blanch O Zeus offspring. Grandsire effect? Rita Biddle, choosing Apollos for group 4 placement!! 95 plus temps.